Our best selling take on the classic Campag 'Peanut Butter' tool. Each VeloSolo wrench is individually CNC machined from an 8mm thick block of aircraft grade heat-treated 7075-T6 aluminium alloy for durability and strength. It's designed purely for one thing - tightening 15mm track nuts (not usable on crank bolts). No bottle opener, no hex keys - just a tactile and ergonomic piece of tool jewellery. Made entirely in the UK and precisely machined for 15mm nuts only. Anodized in choice of eight colours; black, silver, gold, red, blue, green, orange and magnesium bronze. Now in purple too! Laser engraved. Approximately 30% lighter than a Campag tool at 75g. Length is 158mm, slips easily into a pocket. Note: compatible with virtually all dropouts except for some 'cowled' types. New! We have a very limited number of hand polished tools now available! Classic tool for checking and tightening wheels. Singled ended with 15mm box wrench for track nuts. Genuine Campagnolo in forged steel stamped 'Made in Italy'. 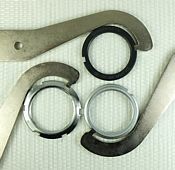 Pro-quality lockring wrench by Hozan of Japan. Recommended for the professional or demanding home mechanic. Cold forged and double ended so should last a very long time. Not cheap but the best. 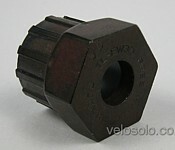 This is a good quality, full size lockring tool at a very affordable price. Out of the box these are superb tools but we have customised these slightly to perform even better. Like most off the shelf lockring tools these do not have a very square 'tooth' - we therfore modify these by milling off a very small part of the rounded end to give a squared off, slightly angled tooth (like the Hozan C205). After milling each tool is individually checked by slotting into a Dura Ace lockring. This modification allows the tool to slot into the square cut-out on all our lockrings (Dura Ace, Andel, Miche and Token) more precisely meaning the tool is less likely to slip in use. The before and after pics show the difference. Length of these is 11" with the main tool made of high strength carbon steel. They have a non-slip rubber handle covering too. Suitable for track cog and bottom bracket lockrings. NOTE: some pictures show previous BBB model, Zenith tool for sale here is shown in first three top pictures. Superb pro tool for the frequent user. As with the C-205 this is cold forged in Japan and a very useful wrench. Twin jaws ensure a really strong grip on Dura Ace type track cog lockrings with no slippage. Also designed for use with headset and bottom bracket lockrings. Superb quality, very versatile and will last a lifetime. A superb best selling tool. These include a lockring tool for track cogs. Essential for removing fixed wheel cogs, holding cassette or cog when using cassette lockring tool (see below) or adjusting track cog lockrings. These are usable with 1/8" or 3/32" chains. These are a real monster tool with strong welded heavyweight construction and very long (14" to 17") tubular handle with rubber grip giving excellent leverage. The chain even has a magnet in the end to stop it flapping about. No tool is un-breakable but these are tough. Fantastic value and highly recommended. An ultra compact multi tool containing 4 essential tools in a tiny 55mm package. Includes 4/5/6mm Allen/hex keys and a Phillips screwdriver. Ideal to always carry around to enable adjustment of stem, bars, seat, brakes etc. Hardened steel tools which fold into a flat steel holder complete with keyring attachment. Total length 55mm with thickness of 7mm. Splined tool for installing and removing the lockring on a Shimano pattern cassette hub. Use this in conjuction with a chain whip (see above) when changing your cassette or swapping for a singlespeed cog and spacers. Superb value with integral rubber coated steel handle (no need for a seperate wrench makes this much more handy than the usual combination) and central locating pin. Splined head in hardened steel. If you buy just one tool this is the one. 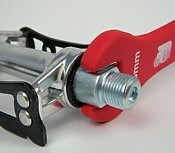 Simple but essential for checking and tightening wheels, pedals and cranks. One end has 14mm and 15mm box wrench for crank bolts and track nuts, other end is 15mm open spanner for pedals. Heavy duty rubber coated steel. Superb value. Genuine Shimano splined tool for removing a multi-speed screw-on Shimano freewheel, not the singlespeed type (use an FR-6 or Dicta tool for this). 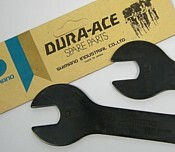 Use with spanner or adjustable wrench. One of those tools that not many cyclists think of buying but for the sake of a few £'s these are really useful. Even more so for singlespeeders and fixed wheel riders concentrating all the wear on one chainring and one cog. This is a precision made measure that tells you when your chain is nearly worn and ready for replacement - a worn chain will in turn prematurely wear your expensive chainring and cog. Simply insert into the top run of the chain and as long as the end does not slot down between the links your chain is fine. There are two marks for 0.75% and 1% - aim to replace your chain by the 0.75% mark for best results. NOTE: some pics show previously stocked and branded BBB model, we have left these up to illustrate method of use. Bike Hand model is exactly the same in use but does not come carded. Simple chain tool for use with any chain. Classic design is reliable and superb value. 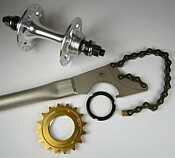 Will work with any chain from singlespeed 3/32" and 1/8" chains to 8 and 9 speed chains. Rear of card contains user instructions. Essential for fitting and adjusting any of our chains. Important: please check this handy link for advice on how to use a chain tool if you have not used one before (note: the standard Rivex does not have a 'tight-link' cradle) as we regret we cannot warranty chain tools damaged by incorrect use! A new chain tool that sits between the Rivex above and heavier workshop YC-324 below. 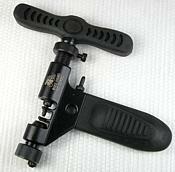 Slightly larger and heavier duty build than the Rivex and with the advantage of an adjustable lower pin/plate support. Great value and reliable chain tool for use with any chain. Will work with any chain from singlespeed 3/32" and 1/8" chains to 8, 9 and 10 speed chains. Essential for fitting and adjusting any of our chains. 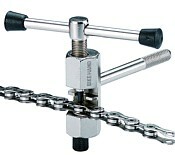 Workshop quality heavy duty adjustable chain tool. Large size (6" long approx). Usable with 3/32" and 1/8" chains. Highly recommended for frequent use especially with heavier duty 1/8" chains. Forged steel with rubber coated handle. Fully adjustable for any size chain and for making precise rivet adjustments as well as normal breaking, joining and shortening of chains. Complete with spare pin (available as spares too - please email to order). Twice the price of a cheap chain tool but far superior. Important: please check this handy link for advice on how to use a chain tool if you have not used one before. In particular the correct positioning of the chain on the lower part of the tool to avoid damage to chain and tool. The upper part of the tool is not intended for splitting chains but just for easing tight links. When using the 324 tool place the chain in the lower part of the tool and first tighten up the lower support screw to rest against the base of the chain before splitting or joining the chain. We regret we cannot warranty chain tools damaged by incorrect use. We stock a large range of cone spanners for adjusting bearings, changing axles when converting Shimano hubs for bolt-on cogs or for general maintenance with any hub. Use in pairs. Various hubs take different sizes, please check before ordering. As a guide, for M756 hubs you will need 13mm and 17mm for the front hubs and 15mm and 17mm for the rear. Suzue Promax SB need 13mm and 17mm. Zenith/Formula/System EX need 15mm and 17mm. All spanners are high quality hardened or cro-mo steel for reliable repeat use. All are double ended. This selection includes genuine Campagnolo 13/14 (£6.95 each) and Shimano Dura Ace in 13/14 (£5.95 each). Sold singly NOT in pairs. As above. This selection includes double-ended Bike Hand 15/16 or 17/18 (£4.95 each). Sold singly. This is a high spec, pro-quality grease from Exus and a perfect size for home use. Professional 'blue' semi-synthetic PTFE formula for fantastic performance on and off-road. Waterproof and suitable for high quality headset and BB bearings, hubs, pedals, threads, stem and seat post installation etc. Large 100g tube will see the average rider through many bike builds and numerous services. A general waterproof bike grease but in handy smaller quantity for occasional use. Nice pink colour too! 25g tube will cover a surprising amount of maintanance tasks. Post free with any other item. £3.50 + free shipping with any other item (otherwise £2.50 shipping in UK, £5.50 EU, £5.50 World). Six high quality feather edge patches, glue and sandpaper in a slimline, pockatable case. Post free with any other item. Paypal's basic shopping cart does not calculate international shipping (please see shipping page for full details). If buying from outside the UK please add the extra shipping required via these 'shipping units'. For example, a cog costs £15.95 and UK shipping at £2.25 will be included. For delivery outside the UK shipping is £4.25 (£2.00 extra) so if you purchase a cog from Europe or USA etc you will also need to purchase 1 x £2.00 shipping units.